Caribbean Export is supporting CARIFORUM exporters to grow their export businesses at the 4th CARIFORUM-EU Business Forum in September 2019. 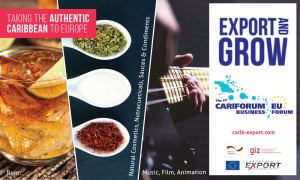 In collaboration with the European Commission and Deutsche Gesellschaft für Internationale Zusammenarbeit (GIZ) the 3-day event to be held in Frankfurt, Germany, will bring together the Caribbean’s leading producers in natural products, rum, sauces and condiments; music, film and animation to meet, European based buyers to support increased penetration of the European market. If your product or service falls into one of the categories below be sure to apply before the deadline, so you can leverage the opportunity to export to Europe and grow your business. Deadline: Thursday, February 28th, 2019 at 3:30pm EST.